I get asked a lot about gun safes. Even when my friends take me for lunch in the downtown, gun safes discussions dominate our conversation. I know for a fact that my advice could potentially have a life-changing impact. So, I am all hears to their questions. The other day, I was sorting through the questions in my mind, and it didn’t take me too long to realize that a lot is being asked about Cannon gun safes. Therefore, I thought of penning down the information to benefit the tens and thousands of people reading this post. For those who don’t know, Cannon is a well-known brand in the gun safe industry, and their products have been well-received by the masses. They have been in the gun safe business for over five decades, and they are one of the industry leaders in the home security, personal safes, and small-scale firearm safes. Compared to the competition, they offer a diverse range of gun safes at wider price points. The fact that they build their safes with worst-case scenarios in mind really sets them apart from the crowd. Given the brand name, quality products, and affordable pricing, I do recommend them without any reservations. But, no two gun-safes are created equal. So, let me introduce you to the cream of the crop. As the name hints, the Foxtrot 24 is a 24-gun capacity safe that’s built like a tank with strong hinges, three locking bolts, and a dual stage fin door seal. 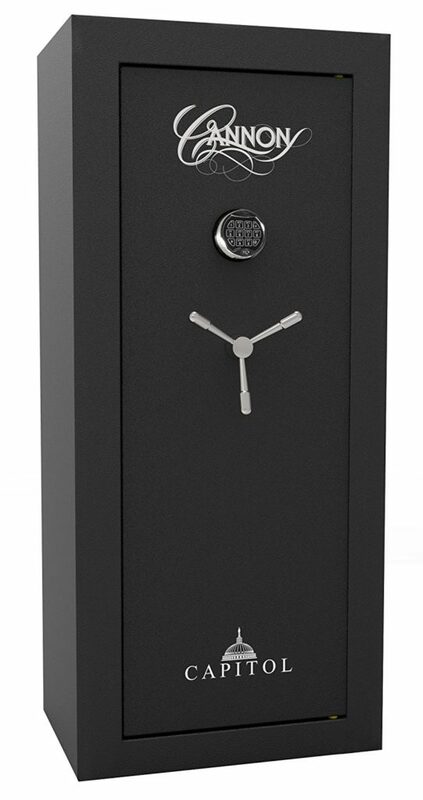 Housed in a well-constructed body and with a 30-minute fire rating, it’s one of those safes that a bank would own. 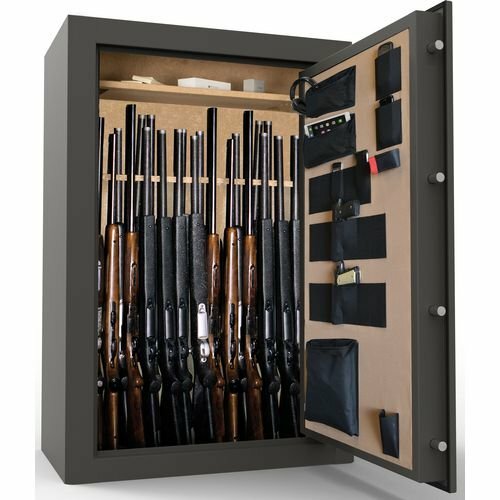 The gun safe comes with center divider and shelves, and of course, a well-made lock, The safe has a nice size to it, and it looks good as well. So, it won’t prove to be an eyesore in the corner of your house. Also, it’s durable enough to last a lifetime. Cannon’s lifetime warranty does not cover the labor cost. So, if you were to run into problems, don’t expect a free lunch. That being said, this product is quite durable and defect free. Therefore, one won’t have to worry about the worst-case scenario. Overall, Foxtrot 24 gun safe is worth a shot! 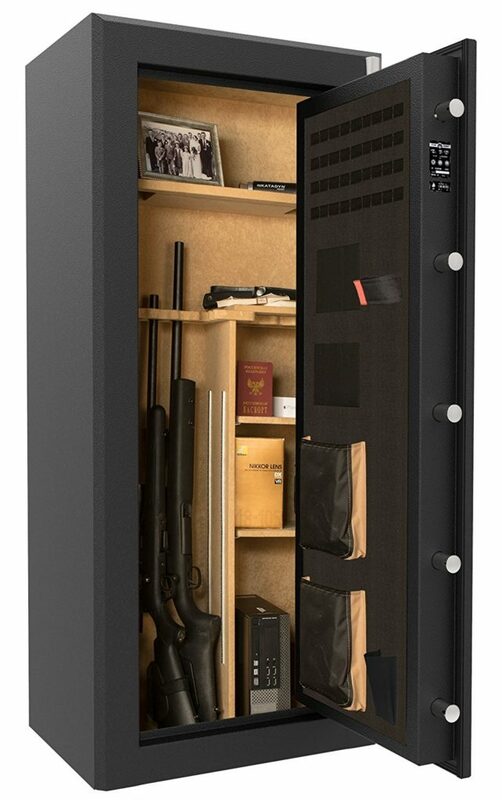 Unlike the rivals, the Cannon All Rifle gun safe model 5936 has an attractive interior. Inside the safe, there are straps and pouches to hold a host of guns, gears, and valuable documents. Basically, the safe has ample space for handguns, firearm accessories, and much more. It’s functionality well-built, and its durable enough to last for several years and beyond. For added credibility, this Cannon gun safe is California DOJ approved. This Cannon gun safe does not come with a backup key. This isn’t a major flaw because the digital lock doesn’t disappoint. I have owned this safe for nearly two years, and the digital lock has never given up on me. I have had people looking for probably dozens of gun safes and then settling for this one. For the protection of your firearms and valuables, the Capitol Series Cannon Safe leaves no stone unturned. The safe has a heavy-duty construction with a patented Trulock internal hinges, six ‘4’ locking bolts and a triple hard plate to prevent drill attacks. It has 24-gun holding capacity. The Cannon Capitol Series Gun Safe model is California DOJ approved, and it has a 30-minute fire rating. It’s about as secure as it can get. Furthermore, the safe is easy to mount on the wall or the floor. The price of this gun safe is a tad bit on the higher side. So, it might not suit the wallet of budget gun safe shoppers. That being said, this Cannon gun safe is worth the asking price. I have owned this safe for months with no issues whatsoever. The lock system works great, and I am never nervous about my gun safety. It’s exactly what I desired. With admirable features, this Cannon gun cabinet is said to be the best in its class. 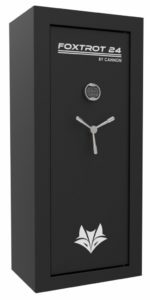 The striking features that can deter theft include patented hinges, hard plates, sturdy locking bolts, smoke protection door seal, and 60-minute fire rating. The Cannon American Eagle Gun Safe is sold in two different sizes—24 and 48-gun capacity. This is not of those flimsy gun safes that have been thrown in the market to make some quick bucks. It’s a sturdy, reliable, and a roomy safe that does a good job of keeping unauthorized hands away from your firearms. Furthermore, it looks nice inside-out, and the locks work like a charm. The thickness of the metal and the quality of the locks are second to none. Since I own a retail store that sells gun safes, I racked this safe to the fullest to verify the manufacturer’s claim. I realized that it requires careful alignment to fit all the 48-guns in the larger unit. Other than this, I am yet to come across any major flaw with Cannon’s American Eagle. Remember, safety is not a status quote. If you live in a rough neighborhood, it’s a matter of life and death. So, don’t let expensive price tags and inexperienced suggestions fool you into believing that you are getting the best in the class gun safe just by shaving off top dollars for the item. There’s a lot more to gun safes than what meets our eyes. Frankly speaking, it’s a gratifying emotion to introduce you to some of the best Cannon gun safes out there on the market today that won’t cost you a fortune, yet provide a safe home for your firearms.